Have you ever ask for a room with a view? And get up to your room to find that your view looks out onto the rooftop of the hotel looking at the air conditioning system. While in Paris we stayed at the lovely boutique hotel and when we arrived, I ask if there was a chance of having a room with a view. They kindly replied that they were totally booked and had no other rooms available. That was fine…hey! 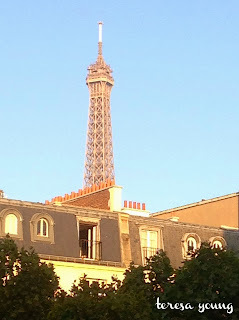 I was in Paris! We got to our room and if this is a room without a view, I can't imagine what one with a view was like. I was very happy with this view….such a beautiful city.